Brownstones are one of the most iconic forms of architecture associated with areas of Brooklyn like Park Slope, Clinton Hill, Fort Greene, Cobble Hill, Prospect Heights, Brooklyn Heights, Bedford Stuyvesant and Bay Ridge2. First appearing in the late 19th century1, many of these historic buildings continue to grace the streets of residential neighborhoods throughout the borough. Brownstones, sometimes called townhouses or row houses, are not entirely made of brownstones but are actually constructed with brick and then faced with brownstones. Brownstones, which are a type of sandstone2, became popular in the 1860s because it was less expensive than other material such as granite, marble, and limestone. It was less expensive because it was found in abundance in nearby places (like New Jersey and Connecticut) and had low mining costs3 because of their porous nature. Another reason they rose in popularity was due to a new movement in art and architecture called Romanticism1 also known as Gothic Revival. In regards to architecture, a building was given a “face lift” by adding gothic elements to a pre-existing building. Also during this time, people began to have an appreciation for darker color schemes4. So in addition to low mining costs and an abundance of supply, brownstones were popular because it had a dark rust like color. 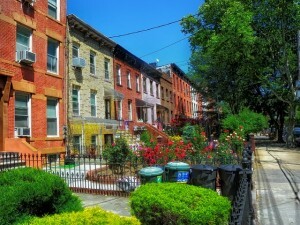 The style of architecture that is currently found in Brooklyn is known as Queen Anne Style3. 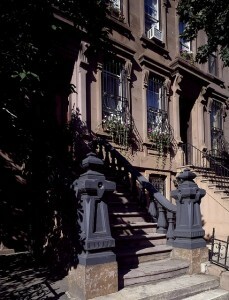 Typical aspects of this style include carved brownstone, wrought iron detailing, and high stairs to the entrances. Now over 150 years later, aesthetics have changed. Not everyone wants to have houses that look exactly the same. More and more people are looking to update their exterior siding of their brownstone at their place of residence in Brooklyn. When faced with the decision of what exterior siding to select from, homeowners are opting to use James Hardie fiber cement siding. There are several benefits of selecting James Hardie siding such as its ColorPlus Technology is UV Ray resistant and won’t fade, it’s pest proof and fire resistant. It’s also the preferred exterior siding of the Landmarks Preservation Commission (LPC). Some brownstones in Brooklyn are considered historic landmarks and if homeowners want to update their siding, who are approved by the LPC5. If approved, the LPC mandates that the homeowners use James Hardie exterior siding for the aforementioned benefits. Whether you’re mandated by the LPC or looking to stand out from the rest of the block, the best bet is to have a James Hardie preferred installer like Good Guys Contracting. 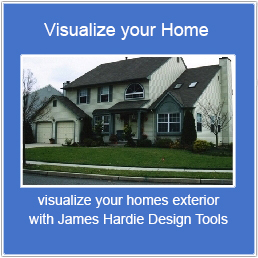 They have worked with several architectures who are approved the LPC and have done exterior siding replacement for several brownstones within Brooklyn as well as the most James Hardie installation on Long Island than any other company. For more information please call us at our Brooklyn location at (718) 285-0285 or fill out the contact form for a FREE quote.